We’ve talked about some of the basics of the confirmation process and the “what” or content that needs to incorporated into this discipleship formation. However, I realized in the last post that I forgot to post any resources to check out in terms of using curriculum from a United Methodist perspective. 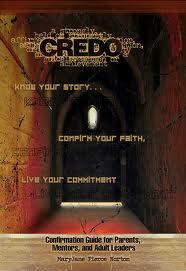 The primary one for United Methodism that you’ll see advertised at Cokesbury is Credo. Also be sure to check with your pastor or district office, who might have a resource director who might be able to make an additional option or two that are specifically designed for United Methodists. So let us now move on to this last part of this series, where we will examine the procedural and logistical matters pertaining to confirmation. Know that these are just recommendations, some of which will be more general while others will be quite specific, so adapt it to your own context as necessary. One of big questions is regarding age. At what age is a youth ready for confirmation? Be sure to use the language of “youth” and never “child”…using “youth” or “young person” helps us adults as much as it does the young person to orient our minds toward the reality of their growth and maturity and that their input is significantly valued. St. Paul talks about “milk then meat” as the process of growing in discipleship. Saying “youth” or “young person” rather than “child” affirms to everyone involved that they is ready for the meatier content of the Christian faith and journey. With that said, the most ideal time in a young person’s life for entering confirmation is when he or she is in 7th grade or later. There are exceptions as some curriculum recommend ages 11-14, so if someone shows remarkable maturity then beginning them in 6th grade might be acceptable. But it’s best, in my mind, to maintain a clear starting point for the youth of your church so that there’s no sense of competition or failure among youth or their parents. Because “If their daughter Suzie got to go through when he was in 6th grade, why is my son Joe not permitted until next year?” Best thing is to set a boundary and stick to it. If a problem arises and persists, then gather the leadership of the church to make a change across the board rather than just making one or two exceptions. The parents/adults see and receive the materials that their youth will be using throughout the process. It eliminates most surprises about expectations of the process. If need be, offer an entire adult confirmation class to the whole congregation so they’re acclimated to the process for themselves and may become more open and excited to incorporate it into the life of the youth. It addresses the basics of what confirmation is and isn’t; including its relationship to baptism – i.e., there won’t be “rebaptism” for those baptized as infants. It lets the parents/guardians/sponsors know that youth will not necessarily be getting on and/or coming off at the same point – that is, it’s a community thing, but each youth will make their own decision based on their readiness (or not) to embrace the Christian faith more fully in confirming or professing it themselves. Around the session(s) when “commitment” comes up, the pastor or youth leader should have a 1-on-1 conversation with each young person asking about their readiness to make the commitment or not. This is a commitment of the parents and mentors too! Parents should choose a mentor in consultation with pastor – mentor should be non-family member. This experience(s) will help youth see several of the aspects of our faith, observe similarities and dissimilarities with other faith traditions, and to discover in person the continued expression of some of our story’s elements and past – where we came from. In Benton County, Tennessee (where my current appointment is located), we United Methodist clergy have met and decided that Lakeshore United Methodist Assembly would be a great location to have the sessions. So if there is a retreat center or campground nearby that would be hospitable, use it! Meet at the various churches who are participating in the confirmation class. Rent a space or find a hospitable place – just be sure the background noise, if any, can be kept to a minimum. It comes down to this reality: We are a connectional church – while small United Methodist churches do have things in common with small churches of other traditions, when it comes to discipleship we can be mutually supportive of other small United Methodist churches and resource with one another. Let’s use the connection to our advantage, which by the way, is a significant reason why it exists! What other ideas or aspects pertaining to the details or procedure of confirmation would you include? Anybody have best practices you would recommend for such settings? Great posts, Jeff! The value of confirmation can be difficult to articulate, but you’ve done an excellent job. The church where I serve (med-large membership) is just completing its first cycle of a 3-year-confirmation experience. Through intentionality in implementation, it’s been a gift growing alongside our young people throughout their confirmation journey. The only thing that I would add, is that experiences throughout confirmation are just as important as the information. So, when learning about works of justice or compassion, make sure that there are expectations for confirmands to participate in missional experiences together. Or, when learning about spiritual gifts, make sure that there are ways for our young people to express those within the community of faith. Thanks, Stephanie! That means a lot coming from you! 🙂 And your additional insights are spot on! Thanks for shedding light on that! I had forgotten that you had shared with me about the 3-year cycle at your church. Glad to hear it has been a positive growing experience for you all.